After taking a few years off writing my (supposedly) annual “Christmas Card Carol,” (because … **blushes**… I didn’t manage to send Christmas cards at all) I decided to try sending my Christmas greetings by e-mail, as I’m better with a computer than a pen. Most conveniently, this little lullaby sang itself to me at 4:30 one morning, and begged to be attached to just such an electronic greeting. Songs meant for little children’s ears are usually fun to compose, and this one was no exception. You need not study for words of four syllables–simple language is best, and the melody can be as sweet as you care to make it. So with all my bests wishes for a wonderful holiday season, here is 2005’s Christmas Card Carol. May your Christmas be filled with angel song. I heard this sung last Sunday. As always – a beautiful song to warm our hearts to the birth of our Savior. Thank you for sharing your amazing gift and talent. Is there a violin part? Once again, this is such a beautiful piece of music. You are truly talented. Thank you so much for sharing your gift. I noticed in the comments above that people were asking if there was a duet version. Is there one. I would love to have a duet do this for our Sacrament meeting Christmas Program. I feel it would really bring the Spirit. If not, we will make this beautiful solo do. I would also love a copy of the duet if you still have it. This is a very sensitive and moving rendition of this special song about the first coming of Christ. The melody so gently supports the meaningful word-story of Christmas. Thank you for this. I taught this to the Congaree Ward Primary last Christmas and they sang it in sacrament. It was as if a heavenly choir of angels were singing. I love this song and the children loved performing it. Thank you so much for sharing your wonderful talent with the world! God bless you. Though early, have a blessed Christmas, as you have been able to bring the spirit of Christmas to so many of us through your lyrics and music. BEAUTIFUL! I sang this as a solo for special music at church and got many comments for both the lyrics and the music. I’d encourage anyone to print this song for use – it’s a keeper. Love this song! 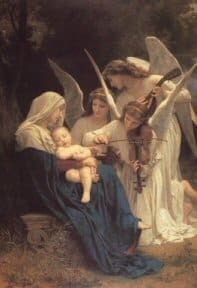 Beautiful melody and the way it tells that all the miricals that happend at his birth were for our our savior Jesus Christ. Also love the way away in the manger has been worked into the piano. I’ve sang this twice. Last year as a solo and this year as a duet. We made up our own harmony and I must say I think it is even more beautiful as a duet! Would love to send it to Sally if she would like it! I would love a copy of the duet version if you still have it! I’ve been searching and searching for one. I’ve tried writing in my own harmonies but that is not my forte.